Born in Edinburgh, Arthur Kirkby went to George Heriot’s School, Edinburgh, one of Scotland’s most historic and distinguished schools, and in 1931 went on to Edinburgh University, graduating with the degrees of Master of Arts in 1936 and Bachelor of Divinity in 1939 with a Distinction in Old Testament Language and Literature. He then continued his academic studies at Mansfield College, Oxford, gaining a Bachelor of Arts in Theology in 1941, and in 1956 completed a part-time PhD on the Theology of Andrew Fuller and its Relation to Calvinism during the early years of his ministry. In 1941 he was ordained into the Baptist Church and began his ministry at the Baptist Church in Hawick in Roxburghshire in the Scottish borders, but in 1945 he was invited to become Minister of the Victoria Road Baptist Church, London Road, Leicester, and he was to remain at Victoria Road for over 20 years, and in Leicester for the rest of his long life. 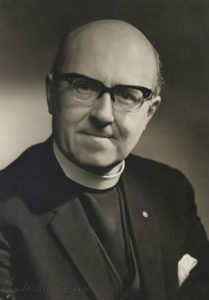 In 1966 he left the Victoria Road Church rather abruptly and for two years Kirkby exercised his ministry assisting other churches including the Charles Street Baptist Church, and St. Stephen’s United Reform Church in Leicester, Thurnby United Reform Church, and he helped a Free Church group in Market Bosworth to establish themselves with their own chapel. In 1968 he at last got another regular job, but this time outside the Church – as Lecturer in Liberal Studies at Leicester Polytechnic (now De Montfort University), where he remained until his retirement in 1979. Arthur Kirkby was very active in the life of the City and beyond, at different times chairing the Leicester Baptist Association and the County Baptist Union, the Baptist Missionary Society (founded in 1792, and of which the Leicester Minister Rev. William Carey was the first missionary). He was for 20 years the Secretary of the Leicester Free Church Council and the founder and President of the Leicester Council of Churches, while he was a founder member in 1958 and for 1959-60 the second President of the Leicester Theological Society. He was also the Free Churches representative who worked alongside the Bishop of Leicester, the vicars of the city centre parishes and the Roman Catholic Prior of Holy Cross to initiate and lead an annual Good Friday Procession of Witness with up to 10,000 participants from Victoria Park to Town Hall Square. He was also very active in civic and community affairs. On his retirement from the Polytechnic he was elected to the City Council and served as a Conservative Councillor for five years, among other things serving as Vice-Chairman of the Finance Committee. Another area of service very important to him was Rotary. He joined the Rotary Club of Leicester in 1949 and remained a member throughout the rest of his life, also visiting many other Rotary Clubs around the world. He served as President for 1961-62 and went on to lead all the Clubs of a large area of the East Midlands as District Governor for 1970-71. In addition to his 50 years Rotary service award in 1999 he received a Paul Harris Fellowship, Rotary’s highest accolade. He joined the Lit. and Phil. in 1948, and was very soon an active member of the Council of the Society, both before and after his presidential year in 1964-65. Also, no account of Arthur Kirby would be complete without reference to his passion for (and expertise in) golf. Within the Leicester Rotary Club he won his first annual competition within months of joining and this was followed by a record 16 more wins, the last when he was already in his mid-70s and still playing off a single figure handicap. His reputation as an outstanding preacher was matched by his reputation as a speaker in the secular world with a keen wit and excellent sense of timing. Referring to the fact the Leicester Rotary Club had managed to find a way to have both himself and Bishop Ronald William in the Club despite Rotary’s rule of just one representative of each profession or industry in each Club he explained that the Bishop’s “classification” must be “Religion – Wholesale” and therefore different from Arthur Kirkby’s “Religion – Retail”! At times he brought both church and secular interests together, as when he preached in the Leicester Cathedral services marking the 50th anniversary of the Rotary Club in 1976 and the 150th anniversary of the Lit. and Phil. in 1985. (His Lit. and Phil. sermon is published in the Transactions for 1985.